This call to action was written by several organisations involved in European campaign against TTIP and CETA, following the July 2015 civil society strategy meeting. While TTIP will still be negotiated for a year or two, it could soon hit us via “CETA”. Now is the moment to stop it. CETA is an agreement negotiated between the EU and Canada, it would be the first so called “new generation trade deal.” Concluded a year ago, on September 25 2014, the agreement has never been formally signed. The deal could be presented any moment to EU Member States for signatures: we must prevent our governments from signing it. Based on available information, it is possible that CETA could be signed by each of the 28 European governments before the end of 2015 to be then approved by the Council and by the European Parliament as early as spring 2016. Once approved by the Parliament CETA could be already ‘provisionally implemented’; this although it hasn’t been voted on by Member States’ parliaments. That’s why we cannot wait to act until CETA’s national ratification stage, we must stop it now! Last year during an EU-Canada summit on 25-26 September CETA negotiations were declared concluded and the 1600 pages of text were published. One year on, on 25 September 2015, we want to dedicate the day to CETA and launch our efforts to stop it! 1 – Sign an open letter and send it to your national and European policymakers on 25 September.. Feel free to translate and adapt it. You can send it to your national, regional and EU members of Parliament(s) and to your Government(s) together with your allies in your country. You have until 18 September to sign it, by filling this form. Share your letter with citizens and the media by imbedding it into a press release. Consider tweeting policymakers to ask them if they will act to stop CETA and encourage your social media communities to also send the open letter as well as share it onwards. Consider tweeting policymakers to ask them if they will act to stop CETA and encourage your social media communities to also send the open letter as well as share it onwards, e.g. using an image like this (you can find an editable version of it here and translate it or adapt it). 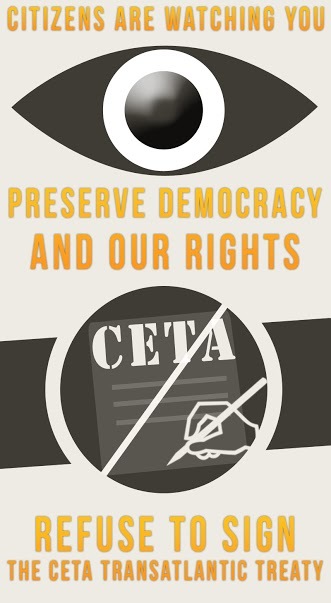 The more people know about CETA, the less they will accept it! A short video explaining clearly how CETA could affect all of us. It is available in English and German for now. If you would like to translate it into your own language(s), you can add subtitles to it yourself or contact Campact who had this video produced, to see how a full translation of the video is possible. Ask your local authority declare itself “TTIP and CETA free”? If it’s already TTIP free, ask for a “CETA free” local motion to be voted as well. You can find here a map of the existing TTIP/CETA free territories in Europe and tools to help you start this process. It is a really useful local mobilization tool, to raise awareness amongst citizens, local politicians and inside political parties and governments. Last but no least when writing, communicating or talking about ‘stop TTIP’ please include ‘and CETA’!